1. 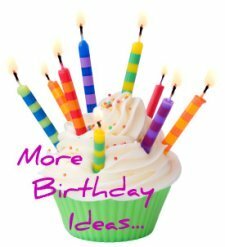 I enjoyed reading about your birthday ideas for kids . 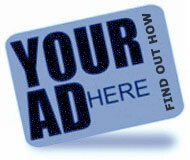 Could you start by telling us a bit about your family and your blog? 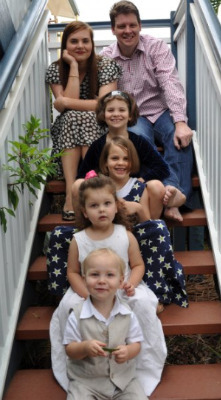 Together with my husband Mathew, we have four children aged 2, 4, 6 and 8. My blog, Be A Fun Mum, is all about the enjoyment of Motherhood, one moment at a time. I combine my love for design, art, photography, parenting, fashion and writing in my space, so it’s become a one-stop-shop blog for parents. When planning a party, especially for children under 5, it’s important to keep things moving. By having 10 minute stations (or longer for older children), the party can be moved through smoothly and the person running the party knows exactly what comes next. 3. 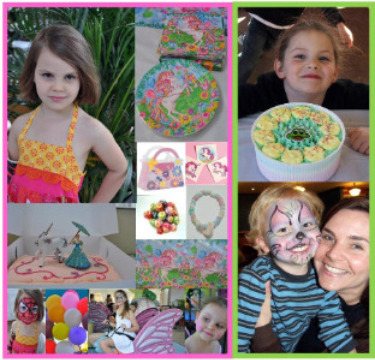 Having 4 children you must be a pretty experienced kids party planner by now? What are your top 5 tips for throwing kids parties? BE RELAXED! I know this may seem impossible; however in my experience, the more relaxed I am, the smoother the party runs. Plan ahead but stay flexible. A little planning goes a long way when you have a group of children together. However, stay flexible because kids are fun and random and sometimes you just have to go with it. There’s a beauty in that. Keep food simple. Don’t go over-the-top when it comes to food choices. I select 4 different foods; for example, fairy bread, fruit, cheerios and lollies to serve plus the birthday cake. Oh, and don’t forget to do a plate of jam and cream scones for the parents. Don’t spend a fortune. Children are easy to please – really. 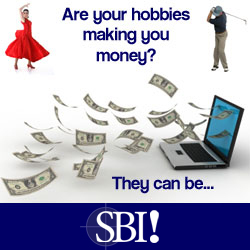 With a little imagination, one can create a wonderful party with little money spent. With my children, we plan ‘extra special’ parties at a venue or with a jumping castle every 3 years. Two Hours. Try and keep the party under 2 hours. After this, everyone starts to fade. 4. Your 100 balloons idea on your blog is such a fun way for kids to wake up on their birthday morning. What other birthday traditions do your family enjoy? Prior to each birthday, my children spend hours looking over our birthday cake book. I do my best to re-create the creation but I’m not a very good baker. HA! Presents from family are opened on the birthday morning, sitting on the end of Daddy and Mummy’s bed. We always sing happy birthday – always. 5. What's the most memorable kids party you've been to? 6. There's so much preparation that goes into our birthday ideas for kids, do you have any tips for after the party? Coffee, coffee and more coffee. But seriously, give food away if you have leftovers or freeze it for future morning teas. I always have the child’s bed made especially neat so they can lay all their new presents on it after the party. This will keep them happy for many hours post party. Put your feet up for half-an-hour before you tackle the mess if you’re at home and be glad it will be another year before you have to do it all again ;) Just before sleep time, climb into bed with your child and tell you how much you love them with a birthday kiss. Kelly, thank you so much for your birthday ideas for kids. It's been an inspiration and a pleasure. Very best wishes to you and your family.